Due to the kerfuffle with the mal-tuned Utopia I had and subsequent measurements to find it not representative, I did measure two Clears. The one above, which you can see by clicking the graph image, and this one. 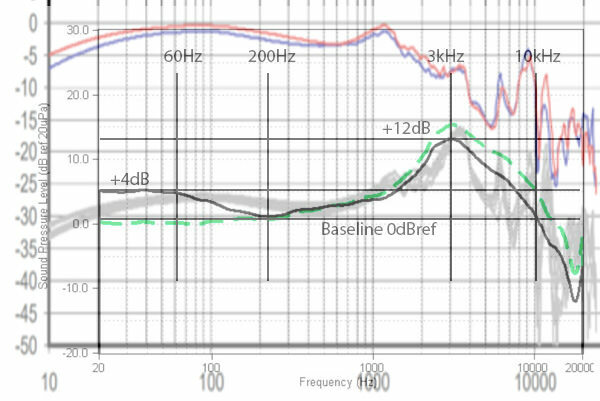 Raw frequency response measurements show very litle change with position on the ear...even up into the very highest frequencies. From 400Hz down there is a very wide humped response providing a modest amount of bass accentuation, which I liked quite a bit. I did hear a slight intrusion of the bass emphasis into the mids, but because the overall emphasis is modest it's not very noticeable. From about 600Hz, a gentle rise starts towards the 3.5kHz peak. The curve has an inflection at about 1.2kHz. I'll note this looks quite like the compensation curve I'm working on that was developed for the upcoming on-line graph tool. I did hear this upper-midrange/presence area on the Clear as dead-on in terms of vocal fundamental and overtone proportions. There's a pretty quick fall after the 3.5kHz peak, and a small subsequent peak at 6kHz. To me this looks like a balancing act between the Elear and Utopia responses in the area. I did hear this area as less refined than the Utopia, but the presence of a larger 6kHz peak on the Utopia is troublesome. I think the Focal engineers struck a very good balance here, and heard the Clear as producing very natural sounding cymbals. 30Hz square wave has remarkably little swayback for an open dynamic headphone; maybe the best I've seen. Bass is nice and strong but lacks a little in textural resolvepossibly due to phase shifting of the large primary driver resonance at 55Hz. 300Hz square wave is similar to the HD 600/650 response with a short ring due to the fairly sharp peak at 3.5kHz, though it's a bit rougher in nature. Like the HD 600/650 I didn't hear this as a problem. Impulse response look fairly noisy, but did not sound nearly as grainy as I would have expected given the measurement. THD+noise plots are quite low remaining fully below 1% on the 90dBspl curve. The 100dBspl curve shows a gentle rise in the bass, but again didn't sound as distorted as one might expect from the plots. 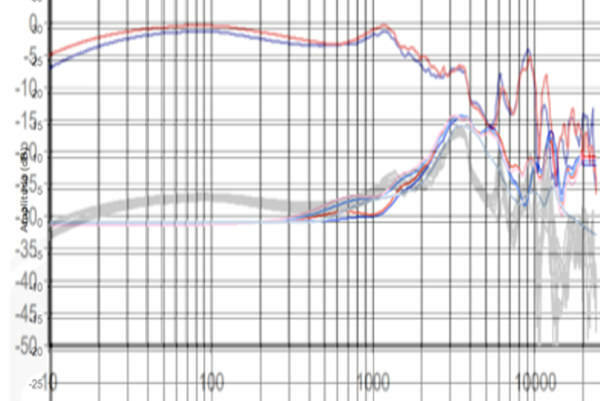 Impedance plot shows a nominally 60 Ohm headphone, but the primary driver resonance at 55Hz is very strong. This will appear as an increase in bass response with higher output impedance amplifiers like OTL tube amps. As such, I don't recommend the Clear with these amps. I'm not sure I know what's going on with my isolation measurements of late, they seem to be wandering around a bit. I'd trust the Clear isolation measurement of the sn A1BRQE000013 measurements more than those shown on the 000007 unit, which does seem to be about 5-10dB more open than the Utopia or Elear above 3kHz. With about 111mVrms needed to achieve 90dB at the ear, the Clear will be driven to solid listening levels by portable devices.